The Classics Club have announced another of their Classics Spins today; I wasn’t sure whether to take part as I’m already reading two classics (Mauprat by George Sand and Vanity Fair by William Makepeace Thackeray) but I’m more than halfway through both so I’m sure I’ll have time to read one more before the spin deadline! It was easy to put this selection together because I only have 25 books left on my Classics Club list now. At this stage, I really don’t mind which one I get, but I’m particularly hoping for number 2, 3, 10, 12 or 17. Have you read any of these books? 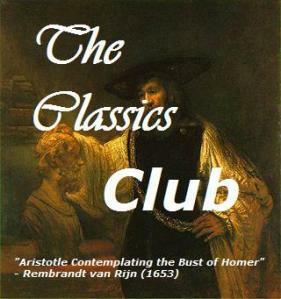 If you’re a member of the Classics Club, will you be joining in with this spin? #20! 🙂 Or #9! Okay, or #19. I would be happy to get Wives and Daughters as I’ve enjoyed everything else I’ve read by Elizabeth Gaskell. I’ve always wanted to read this one, so that’s good to know! I have read #10 (excellent! ), #16, #17, and #20. I read Prince of Foxes because of my Big Fat Reading Project. In fact, he was a bestseller in the 40s and 50s so I have read three of his: Prince of Foxes was #10 in 1947; Lord Vanity #9 in 1953; Captain From Castile #8 in 1945. All great reads with never a dull moment! I’m pleased to hear that! If I enjoy Prince of Foxes I’ll definitely look for the other books you mention. Of these I’m especially fond of I, Claudius and Wives and Daughters. I loved Shirley when I first read it but on a recent reread found it more of a slog. You have a good variety on your list; I hope you get something that suits your reading mood! I’m looking forward to reading both I, Claudius and Wives and Daughters. I’m not sure about Shirley, but it’s the only Bronte novel I haven’t read yet so I really do need to read it! I’ll have my fingers crossed for Excellent Women. I think you’ll enjoy The Heir of Redclyffe, but after the two you’re reading now you might be ready for something shorter and lighter? A short, light book would be nice, although there aren’t many of those on my list! Nice list! I think I’ve read all of them except 2, 9, 13, 16, and 17. I have just posted my list for the spin, most of which I have already read at least once. I am actually looking forward to finishing my list, because I think I have a lot more sources, now, for making up a list of books that are new to me. I’ve only read Around the World in 80 Days, and it wasn’t a favorite, unfortunately. So I’m hoping for anything other than #14, so that I can find out more about the books. Good luck! I’ve seen some very positive reviews of Around the World in Eighty Days and some very negative ones, so I’m interested in reading it for myself to see what I think! You have so many good ones on the list, it’s hard to choose. Gaskell is always good and I’ve seen Kristin Lavransdatter on a few lists. Have a great spin! I love the sound of Kristin Lavransdatter – it’s only the length that has put me off reading it before now. I would be happy to get that one on Monday. My top picks from your list are Wives & Daughters, Excellent Women, Howards End, and East of Eden. I also liked I Claudius but it was a little tougher to get into — very heavy on the history, but definitely enjoyable once you get into it. Good luck with your spin pick! I’ve been a bit hesitant about reading East of Eden, but lots of people seem to have loved it. I’m looking forward to reading all of the others you mention! I’m taking part in the spin too – and also have Wives and Daughters on my list – not at the same number though. I’ve read some of your list – 1,3,5,6,7,15,16 &18 and I liked them all! Good luck with the spin! Thank you. It’s good to know that you’ve enjoyed so many of the books on my list! Mauprat turned me onto George Sand. It’s hard to find her books still in print though, so it is taking me a while to find some nice second hand copies of her books. Mary Anne is also the book that hooked me on DuMaurier. The Day of the Triffids is an old favourite and East of Eden is my favourite Steinbeck to date (many of these books are on my classics club reread list). Mauprat is the first George Sand book I’ve read and I’m enjoying it so far. I’m reading a free ebook version because, as you say, her books are not easy to find in print. I’m glad to hear you liked Mary Anne, The Day of the Triffids and East of Eden! Good luck with the Spin – I hope you get one of the books you’d like to read the most 🙂 I have been away this weekend so I haven’t had time to take part this time. I very much want to read I, Claudius, but everything on your list looks great. Best of luck with your spin pick! Thanks. I’ve tried to include a mixture of well-known classics and some that are more obscure.